This entry was posted in Cycling Clothing Information and Articles on February 25, 2013 by encove. The British Winter: December, January and February are usually the coldest months, even in these colder months it’s fairly rare for daytime temperatures to drop below freezing. We normally find the warmer temperatures in the south and as you gain attitude the temperature will drop by around 1 degree Celsius per 200 metres of ascent. Generally we don’t endure sustained periods of Arctic temperatures in the UK. Your resistance to the cold: How warm your body feels can depend upon how much fat you carry and how fast you heart is pumping the blood around your body. We assume that when cycling your heart will be pumping your blood faster and therefore heating up your entire body. During exercise excess body heat will escape as moisture from your torso, head, hand and feet, regardless of your body mass, blood pressure or circulation. The weather conditions: Wind and rain are the two major factors that change how the temperature actually feels. While rain can just make a ride miserable a wind chill can provide the greatest temperature decline especially to the face and hands. The Met Office often state the temperature is 4 degrees Celsius but with added wind chill it actually feels a few degrees less. Winter Mornings and Evenings: With shorter days the evening temperature will drop fairly quickly and early mornings can be bitterly cold. How do you ride? Before you buy a winter cycling glove you should take all of the aforementioned into account. But also think about the style of cycling your do and how much energy you are likely to burn; are you a commuter, a serious road cyclist, a mountain biker or a causal cyclist? What time of day do you cycle? For example a commuter will often cycle at a moderate rate in early morning and late early evening when it’s quite chilly, whereas a serious road cyclist is more likely to ride long distances during warmer daylight hours, building up serious body heat. A mountain biker will likely ride days building extreme body heat climbing to higher colder altitudes and a casual cyclist may ride a couple of miles not even braking into a sweat. The Winter Cycling Glove: Winter isn’t just a few bitterly cold days, it is a season that spans a quarter of a year, it’s nigh on impossible for a single glove to accommodate all of the extremes. First and foremost a cycling glove is a sports glove and safety should always be the first consideration. A cycling specific glove should have enough freedom of finger movement to facilitate easy use of brakes and gears. It should feel comfortable and able to allow excess moisture to escape and of course it should also look aesthetically pleasing. Many of the features incorporated into a winter glove are there for practical reasons. For example longer elasticised cuff with no fastener are designed to hug the wrist to keep it warmer, in theory the build up of heat will transfer to the fingers. 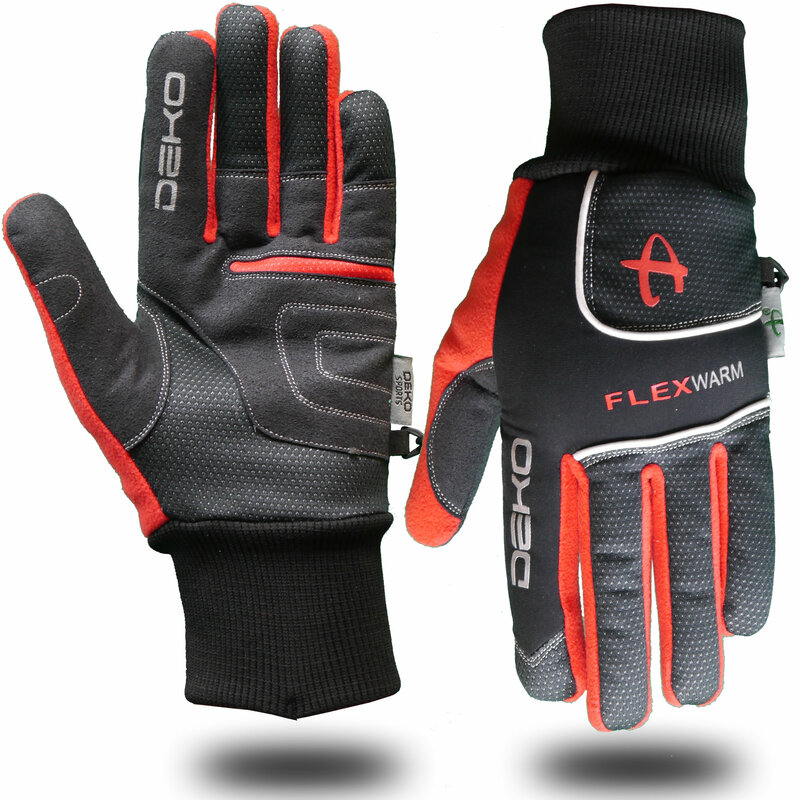 Windproof materials will protect the backhand and knuckles from a cold cutting wind. Striking the balance so your glove isn’t too warm, too sweaty or not warm enough means the glove is likely to have some form of ventilation for air flow, because this can cool down your hands in very cold weather you may also require an under glove (base or liner glove). These lightweight gloves, usually a Spandex type material, act as an extra layer in much the same way as you would wear layers on your torso. Before you ride: Putting a cold glove onto cold hands won’t give an immediate benefit! I was recently talking to a mountain biker who was doing some winter night riding; he was complaining that he started his ride and his fingers were freezing. Upon further investigation it turned out that he had taken his bike on the back of his car to a forest, unfastened and prepped the bike (put on the lights etc) with bare hands. His hands are starting off cold because they have been direct contact with the icy cold metal on the bike. Furthermore his gloves were stored in his backpack in the cold car boot and they were the last things he put on before he set off on his ride. I pointed out that warming the hands and the glove before taking to the saddle would have given some benefit. Simply storing the gloves inside the cockpit of the car, sitting on them during the journey or sticking them down his pants will retain some level of insulation. Warm up your hands with your gloves on while moving your fingers to increase circulation. Simply make sure that your hands and your gloves are as warm as you can reasonably make them before the ride, then when you get on the move eight times out of ten the increase in blood circulation should do the rest. Conclusion: All in all there is no one remedy for the dilemma of the winter cycling glove, but with common sense and a little perseverance you will find gloves that generally suits your needs. This entry was posted in Cycling Clothing Information and Articles and tagged cycle gloves, cycling clothes, cycling gloves, cycling wear, winter gloves on December 15, 2012 by encove. The New 2013 Deko Air Jersey now in Long and Short sleeve options. Don’t you find it ironic that many conspiracy theorists predict the World will end just because the Mayan calendar ends on the 21st December 2012, which coincidentally also so happens to be the Winter Solstice. Many ancient civilisations including the good old British Pagan measured the passing time using the sun at its highest and lowest ebb. So, the winter solstice is a perfectly logical place to end the calendar, I’m sticking with my prediction that the world will end on 30th February 2372. However, just in case I’m wrong we are offering the newly designed 2013 Deko Air Cycling Jersey for pre end of world and for pre Christmas delivery. I was going to say the new Deko Air cycling jersey in both long and short sleeve is “The dawn of new era”, but like the end of world claims that may be a little “over the top”. The styling of the jersey has simply been re-coloured and restyled, tweaked to better suit the demands of the average British cyclist. One of the big criticisms we received on the old version of the jersey was: “I Like the Euro styling but not short body”. A contradiction in terms, maybe, but what’s fairly clear is this shorter “club fit” styling may suit Johnny foreigner, but us Brit’s want our bums covered and our rear pockets lower and more accessible. As you can see from the photos of the long sleeve version the front body length is now roughly the length of your arm to your wrist. You can now go for a tighter fit and still retain a good degree body length. We introduced the “Deimos”, long sleeve version of this jersey in 2011 in a range of different colours to the “Tethys” short sleeve. For 2013 we have brought the ranges together to give the same colour options in long or short sleeve. We have added popular Black, Blue and Red options to the range while still retaining a high degree of white elements to the designs to help increase visibility on the road. You can now have the same style and colour option in both long and short sleeve. We are still using the D-Vento fabric which as a super cool knitted, stretchy, breathable material and we stuck with the quarter zip although there was some debate about moving to a full zipper. We assumed that even the most vain road cyclist only wax their legs. So with that in mind we decide that on a light weight body hugging cycling jersey the full length zippers caching chest hair can often make the eyes water. The tighter fit also means the jersey can double as an extra layer on cooler winter days. All in all we believe the 2013 Deko Air Cycling Jersey has been thoughtfully restyled around the typical British cyclist. 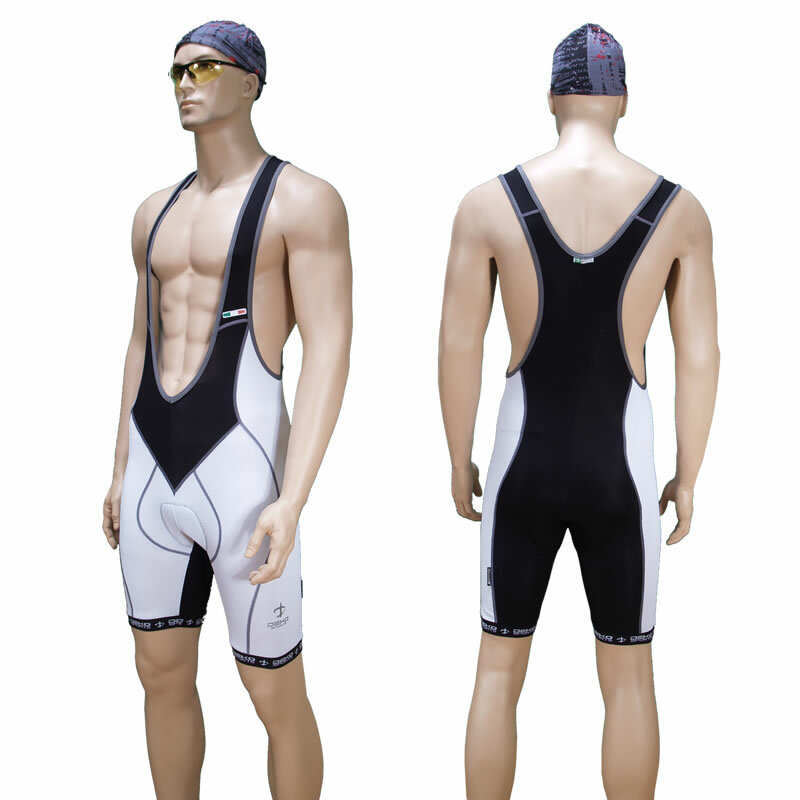 This entry was posted in Cycling Clothing Information and Articles on December 2, 2012 by encove. Why would you choose bib shorts over something less flashy? After all, perhaps you do enjoy mountain biking or some other form of ‘more energetic than average’ cycling but don’t necessarily want to look like an Olympian? At this point you really have to start thinking about yourself. Don’t fixate on how others perceive you. Concentrate on how much you enjoy your cycling. And if you enjoy it a lot, are there ways you could improve the experience? Of course there are always ways to improve performance. There are many accessories available to you – padded undershorts, jerseys, gloves, leg warmers and many more. But bib shorts are amongst the best, which is why you should give these important items of cycling clothing some serious consideration. While bib shorts are built for supreme aerodynamics, there’s a whole lot more to them. They provide excellent back support, not to mention cushioning that crucial point where body meets bike seat! What about simple comfort? The lack of a waistband ensures there are never any issues with your gear riding up your body or loosening. The bib shorts stay moulded to your physique, allowing you to concentrate on the job in hand. Bib shorts will keep the chamois in place, which is especially useful when you’re jumping in and out of the saddle a lot during terrain biking. A common gripe is the temperature issue. The Lycra effect does look a bit smothering, doesn’t it? However, bib shorts are specially designed. Examine them close-up and you’ll see that while they might resemble the restrictive covering of wetsuit from a distance, they are actually built with a layer of light mesh. This allows the garment to ‘breathe’ very well. This helps to wick sweat, like a base layer. How to choose your bib shorts is always an issue. Unlike choosing other items of cycling clothing, where you can usually select based on your normal garment sizing, these can vary between brands. It’s really recommended to try before you buy. Sometime you can discover straps that are so loose fit you might as well be wearing normal shorts. Another tip is to buy your bib shorts based on wearing them on your bike. This might seem like common sense but you get a far better idea of how the shorts will fit as you sit on the saddle, rather than preening in front of the mirror! This entry was posted in Cycling Clothing Information and Articles and tagged Arm Warmers, bib shorts, cycling shorts, cycling tights, female cyclist, Gilet, lycra shorts, padded shorts on November 8, 2012 by encove. Mountain Bike Trails around Reeth and Swaledale |. This entry was posted in Cycling Clothing Information and Articles on October 24, 2011 by encove. A customer emailed us with a question: “Hi, Got the jacket and cycling gloves so I could wear the jacket on my Saturday ride but was really fighting to stay warm (16c 20mph wind). I was wearing a heavy base layer and the wind was coming straight through the jacket and if not for the base layer I would have been really cold. So my question is have I purchased the wrong jacket type for my winter cycling as it will get a lot colder over the coming weeks”. The customer had actually bought a jersey with a full length zip, not a jacket, and with the best will in the world a jersey is not designed to do the work of a jacket. I know that many cyclists wear a full zip jersey as an additional layer but when it comes to wind and rain they will also have the added protection of a rain or wind jacket. When winter sets in it is important to have the right balance of clothing for cycling. This can mean many things to many people for example on Friday afternoon 21st October my brother in law and I decided to take a mountain bike ride. Our route started from Castle Bolton in Wensleydale towards Askrigg then over the hill to Swaledale and along Apedale Road back to Castle Bolton. On the first leg we travelled along the northern slopes of Wensleydale in a westerly direction head on into north westerly winds of 25mph, while the temperature was suppose to 12 to 15 degrees Celsius the wind chill factor would have reduced that significantly. However cycling into the wind means we were burning more body heat. To cover my torso I was wearing a full sleeved Xpandx base layer under a short sleeved summer jersey and a wind proof gilet on my bottoms I wore a ¾ length baggy cycling shorts, on my feet waterproof Sealskinz socks with cycling shoes and full finger gloves to protect the hands . My brother in law wore two layers of jersey and a wind proof jacket to cover his torso, full length cycling tight under baggy shorts to cover his lower regions, Sealskinz socks with cycling shoes on his feet and to save his hands from cold windproof gloves. I also carried a compact waterproof jacket in my bag in case of rain. While we would never make the cycling wear fashion statement, the important thing is neither of us felt the cold while on the move. This entry was posted in Cycling Clothing Information and Articles and tagged cycling, Cycling Clothing, cycling jacket, cycling jersey, cycling shorts, layering for cycling on October 24, 2011 by encove.